It’s All About Animals. . . and You! Learn about what it takes to run a world-class zoo, from caring for our animals to saving wildlife habitat and inspiring others to take conservation action. Woodland Park Zoo is a premier facility for providing exceptional care for its animals as well as pioneering new procedures and techniques for animal care in zoos throughout the world. Education is the key to promoting our mission of conserving animals and habitat. Our innovative and far-reaching programs teach toddlers through adults how nature can be an inspirational springboard for conservation action. Our Field Conservation projects, 38 projects in more than 50 countries, target and reward effective programs that preserve species, protect habitat and build capacity within the areas, and among the people, who are most able to create direct action. 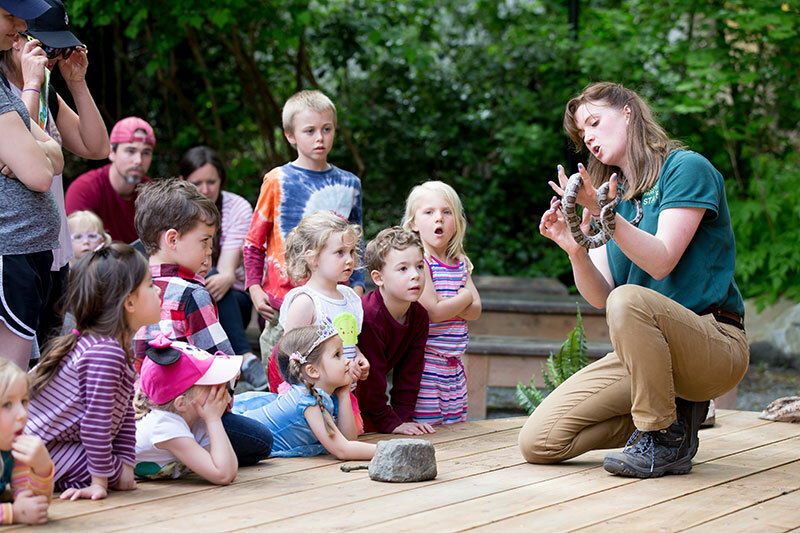 Every day Woodland Park Zoo saves animals and creates lifelong memories that inspire people to conserve the natural world. Every gift of time or money, large or small, helps the zoo build a better community — your community. Thank you for investing in a more sustainable future for wildlife. Invest in the future of conservation and get to know the zoo in intimate ways. Wild at Heart donors are the lifeblood of our work, helping us to create a sustainable future for people and wildlife. Enjoy unlimited free admission, fantastic benefits and help save wildlife. Make a lasting impact. Legacy gifts help build Woodland Park Zoo’s endowment, providing resources in perpetuity to inspire people of all ages to learn, care and act on behalf of wildlife for many years to come. Amplify your gift with matching funds to make an even bigger difference for wildlife. Check here to see if your employer will match your gift. Provide stable support to the zoo with monthly or quarterly gifts. Select the “recurring gift” option on the donation form or contact donations@zoo.org. Connect with other young professionals who are passionate about animals, conservation, and the zoo’s mission. 1. How can I make a gift? There are many ways to make a gift to Woodland Park Zoo. 2. How will my gift impact the zoo and our community? Gifts fund mission based programs that help save animals and their habitats in the Pacific Northwest and around the world, as well as create new visitor experiences, world-class animal care advancements and STEM education leadership programs for underserved youth. Additionally, gift funds help maintain zoo facilities and our acres of botanical gardens. Gifts are directed to the areas of greatest need unless specified otherwise by our donors. Woodland Park Zoo is a qualified 501(c)(3) non-profit organization, #91-6070005, registered in Washington state. The amount of your charitable contribution for income tax purposes is the amount given less the fair market value of benefits you receive, whether used or not. Please consult with your tax advisor to determine the potential deductibility of your gift. Donors who give $500 or more annually join our Wild at Heart donor pack and enjoy benefits, some of which have a fair market value. You can choose to waive these benefits to allow the entire gift amount to be eligible for a tax deduction. To do this, please contact us at donations@zoo.org or call 206.548.2491. The 2017 - 19 fair market value of Wild at Heart benefits is $295.00. The 2015 - 16 fair market value of Wild at Heart benefits is $261.80. All Jungle Party tickets, merchandise, item purchases and sponsorships have a fair market value. The amount of your charitable contribution for income tax purposes is the amount given less the fair market value of benefits you receive, whether used or not. Please contact us at donations@zoo.org for details about the value of your benefits. The fair market value of standard benefits are listed below. Thrive tickets and sponsorships have a fair market value. The amount of your charitable contribution for income tax purposes is the amount given less the fair market value of benefits you receive, whether used or not. Please contact us at donations@zoo.org for details about the value of your benefits. A ZooParent adoption is eligible for a charitable deduction. The amount of your gift that is deductible for federal income tax purposes is the amount given less the fair market value of benefits you receive, whether used or not. IRS rules allow taxpayers to claim charitable deductions if the benefits received are considered token items. The fair market value of benefits received for each ZooParent adoption level is listed below. Please contact ZooParent@zoo.org for details about the value of your benefits. Woodland Park Zoo is a qualified 501(c)(3) non-profit organization, #91-6070005, registered in Washington state. The amount of your charitable contribution for income tax purposes is the amount given less the fair market value of benefits you receive, whether used or not. Woodland Park Zoo determines the benefit of unlimited entry to the zoo to be the full cost of the membership. However, IRS rules allow taxpayers to claim a charitable deduction only if the total membership fees paid is $75.00 or less. Please consult with your advisor to determine the potential deductibility of your membership. A corporate membership is eligible for a charitable deduction. The amount of your charitable contribution for income tax purposes is the amount given less the fair market value of benefits you receive, whether used or not. The fair market value of benefits received for each Corporate Membership is listed below. Please contact membership@zoo.org for details about the value of your benefits. 4. How do I know if my company will match my gift? Many local companies match their employees' donations. Look up your company and see if you can double your support, or ask your HR department for more information. Then just fill out the online matching gift request or turn in your matching gift form to your employer to get the match! 5. What is a donor-advised fund? Since the initial contribution to the DAF is eligible for tax deduction, the donor cannot receive any goods or services from Woodland Park Zoo. Event tickets, table sponsorships and zoo memberships are not eligible for DAF grants because they contain benefits that are not tax deductible. Also, a DAF cannot be used to pay a personal pledge made by the donor. If you plan to make grant recommendation from a DAF, please contact Sarah Valentine to make a non-binding gift agreement instead of a personal pledge. 6. Can I receive any benefits if I direct a gift through another entity? Donors who give through a private foundation, donor-advised fund, United Way, Benevity and other similar organizations cannot receive any goods or services from Woodland Park Zoo because the initial contribution is eligible for a tax deduction. Event tickets, table sponsorships and zoo memberships are not eligible for directed gifts because they contain benefits that are not tax deductible. Many employers have moved to utilizing Benevity, a company that facilitates workplace giving and matching gift campaigns and is also a donor-advised fund. Check with your employer to confirm if they are using the Benevity platform. 7. What is a planned gift? Wills, trusts and inclusion as a beneficiary in estate plans are all types of planned gifts that help preserve the future of the zoo and ensure your legacy. Learn more. 8. How can my company become involved with the zoo? Businesses and other organizations can get involved with the zoo by sponsoring Jungle Party, Thrive or a marketing promotion, becoming a corporate member, hosting an event at the zoo or through corporate philanthropy. Contact Sarah Valentine to learn more. 9. Why should I sign up for a Donor account? Why don't I see my gifts on my Donor Giving History page? When you sign up for a Donor account you can look up your giving history and update your donor contact information.Sign up for your account. The Donor Giving History page lists cash donations received in the last three years. Please consult with your tax advisor to determine the deductibility of your gift as not all gifts listed are fully tax deductible. You may contact us at donations@zoo.org to request a tax receipt. If you believe there is an error, please contact us at donations@zoo.org. 10. What is your Donor Privacy Statement? Woodland Park Zoo recognizes the importance of protecting the privacy of the individuals and organizations maintained in our database. You can view our full privacy statement here. 11. Do you adhere to the Donor Bill of Rights? Yes, to ensure that philanthropy merits the respect and trust of the general public, Woodland Park Zoo joins many other fundraising organizations in declaring that all donors have the following rights. Read more.